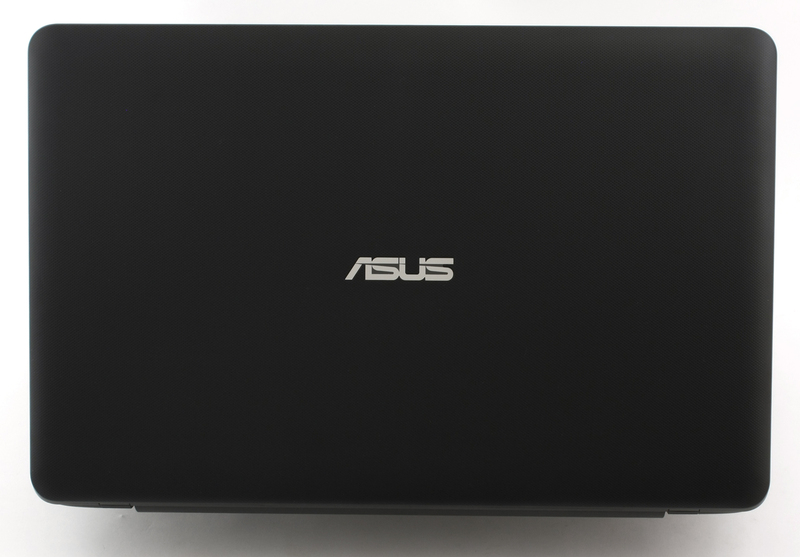 ASUS is famous for rebranding some of its notebooks by using the same chassis and thermal design, but labeling it as another product with a different paint job. The case with the K751LX is basically the same. It comes as a bigger sibling to the previously reviewed K550JX, but with a notable difference – it has a dual-core Core i5 or i7 CPU (depending on the configuration) instead of the speedy quad-core Core i7-4720HQ found in the K550JX. Anything other than that is almost the same, except for the size, of course. 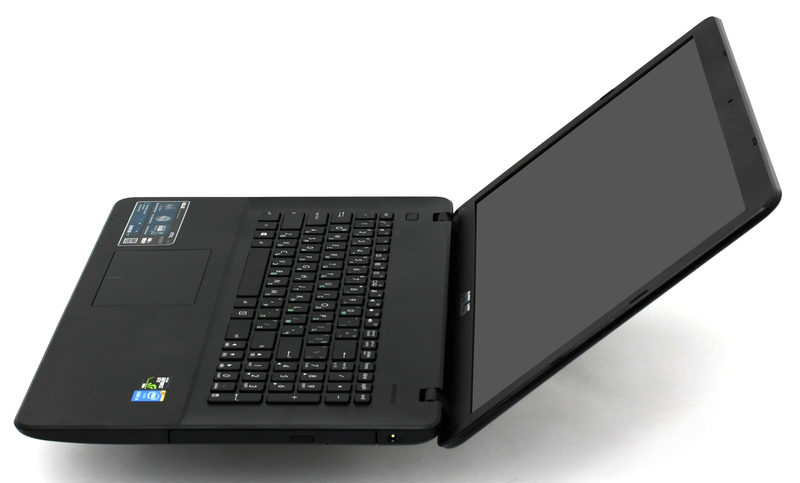 We are presented with almost identical thermal design, keyboard, touchpad and port placement. Nonetheless, the chassis has a different pattern and feel, but somehow offers the same sturdiness. 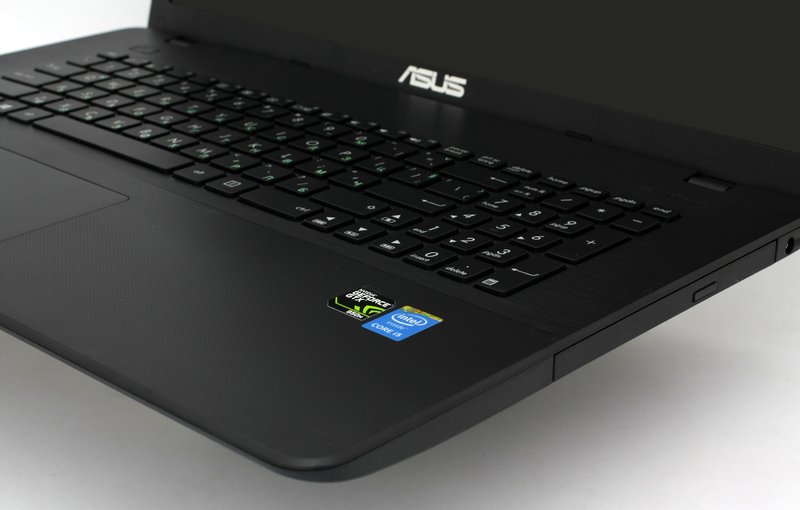 Anyway, we expect the notebook to perform well in our performance tests as it boasts an NVIDIA GeForce GTX 950M GPU and when you don’t need the extra power and power saving is more important, the Core i5-5200U CPU should take care of that. 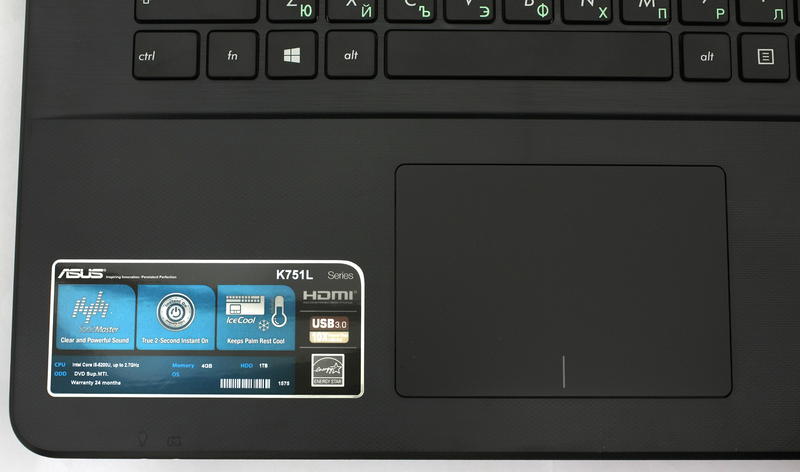 So we hope that the ASUS K751LX notebook will prove to be a well-balanced 17-incher with a good performance/price ratio, serious graphics performance when needed, and good battery life. 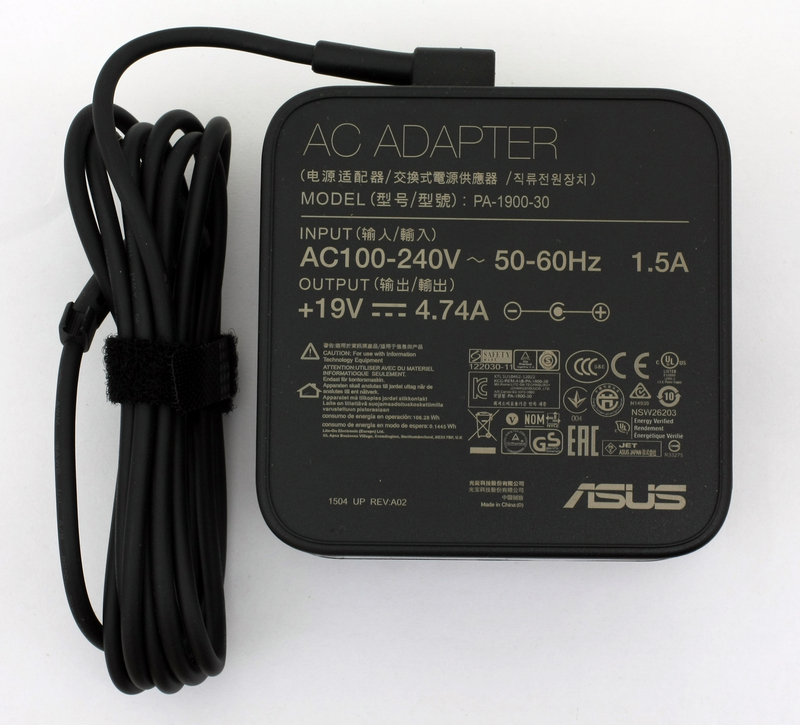 The retail package contains the usual stuff like an AC charger, cable, user manuals and the notebook itself. The notebook is entirely made of plastic – it can’t stand against its high-end aluminum relative N551, but the latter is much more expensive. The plastic attracts some fingerprints, but the surface feels nice and provides comfortable grip. As per usual, we start with the lid. It features hard plastic with a somewhat rugged pattern providing comfortable grip, as stated above. The hinges feel overtightened and it’s impossible to open the lid without using both hands. However, this could means that you won’t have problems with them in the long term. The bottom piece is again made of plastic but feels more stable than the lid. Also, the finish feels more rugged-y. There’s nothing of particular interest except for the small grills near the front, which we doubt will be of any use with an external cooling pad, but given the energy-efficient processor, you probably won’t need one anyway. The machine weighs 2.8 kg, which is great for a 17-incher. We also really liked the port placement – ASUS has managed to fit almost all ports on the left – 3x UXB 3.0 ports, HDMI, VGA, LAN and main heat dispersing grill. The right side only has the DC charging port and the optical drive. You can insert your SD cards at the front below the status LEDs. This design choice leaves more space on the right side and will not obstruct the usage of an external mouse. The interior consists of two main sections, with the one on the palm rest area following the same design pattern on the lid, while the keyboard tray imitates a brushed aluminum finish. The keys appear to be a bit small for a 17-incher. We would have been happier with a bigger keyboard and larger touchpad as well. In any case, both input devices performed okay – the keys offer relatively long key travel and a bit of “clicky” sound. The design is tight, almost austere, nothing too special, but offers a good keyboard and excellent port placement. 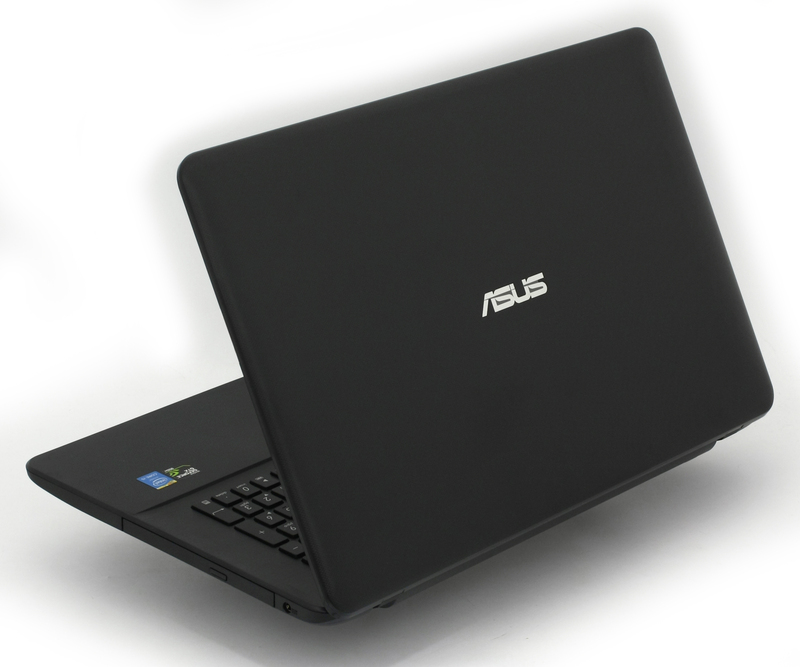 The ASUS K751L uses a WXGA++ HD+, TN panel with glossy finish, model number N173FGE-L23, manufactured by Innolux. The diagonal is 17.3 inches with a 1600 x 900 resolution, 16:9 aspect ratio, 106 ppi and 0.239 x 0.239 pixel pitch. It can be considered “Retina” when viewed from a distance equal to or greater than 81 cm. 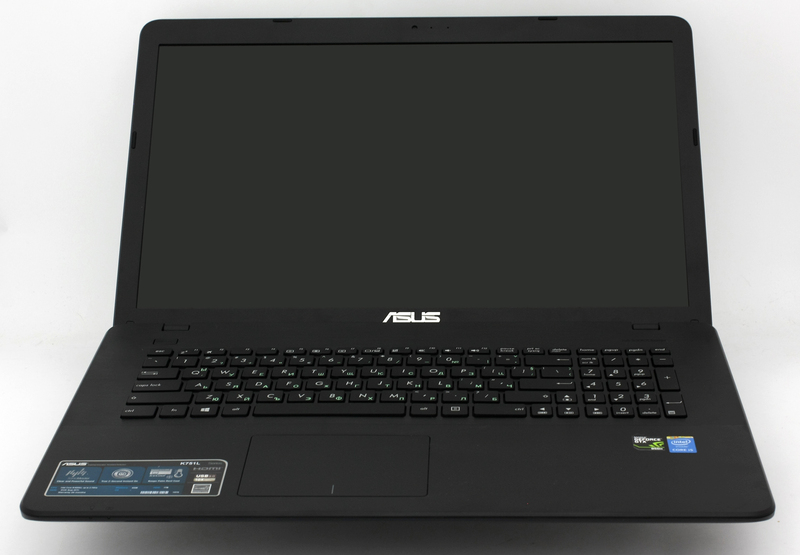 ASUS K751LX offers poor viewing angles due to the use of a TN panel. The image below represents a view at a 45-degree angle. We measured a maximum brightness of only 214 cd/m2, which will make normal usage outdoors or near a window a bit difficult. However, it should be bright enough for a well-lit room. The maximum deviation is 20%, which can be considered nearly problematic. 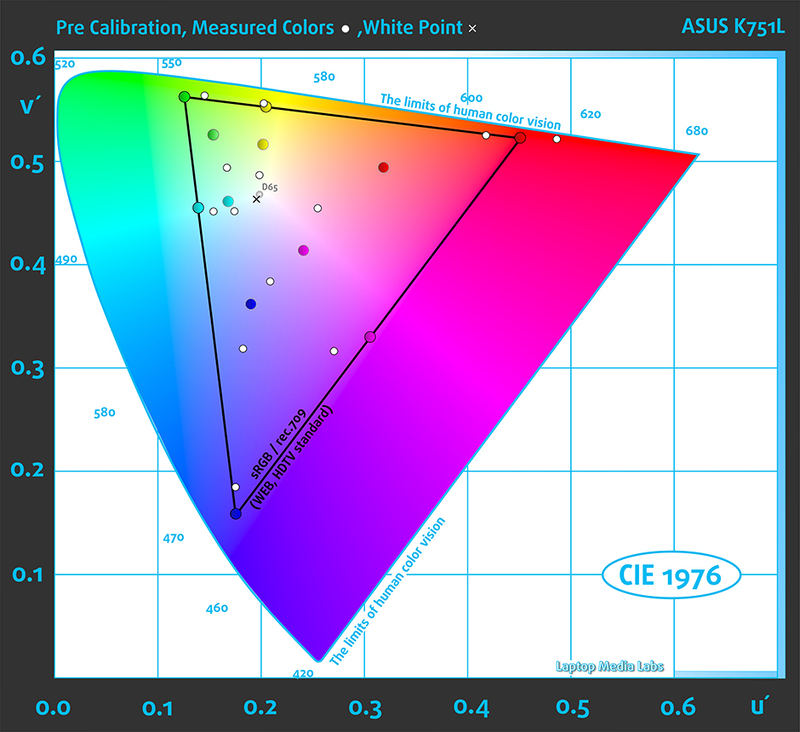 The color temperature is 6900K – a bit colder than the optimal 6500K. To our surprise, the panel covers 79% of the sRGB color gamut – a good result given the nature of TN panels and the price tag of the machine. The graph below is the same but with recorded results – the one on the left is pre-calibration, while the one on the right is after. The colored circles represent the reference colors, the white circles being the result. You can see the main and additional colors with 100% and 50% saturation inside the sRGB gamut. For calibration we used X-Rite i1Display Pro. We tested the display using 24 commonly used sample colors like skin tones, grass, blue sky, orange etc. After profiling the display had an average DeltaE 2000 deviation of 1.45. The contrast ratio before calibration was 525:1 and came down to 410:1 after. Here are other colors that we’ve tested. Unfortunately, ASUS K751LX’s display uses PWM across almost all brightness levels and the frequency of the emitted light is really low (200 Hz), so the display can be considered “aggressive”. Some users will most likely feel eye fatigue or even headaches after prolonged usage. In order to avoid that, you should use it at its maximum brightness level (100% = 224 cd/m2), at which the display doesn’t use PWM at all. 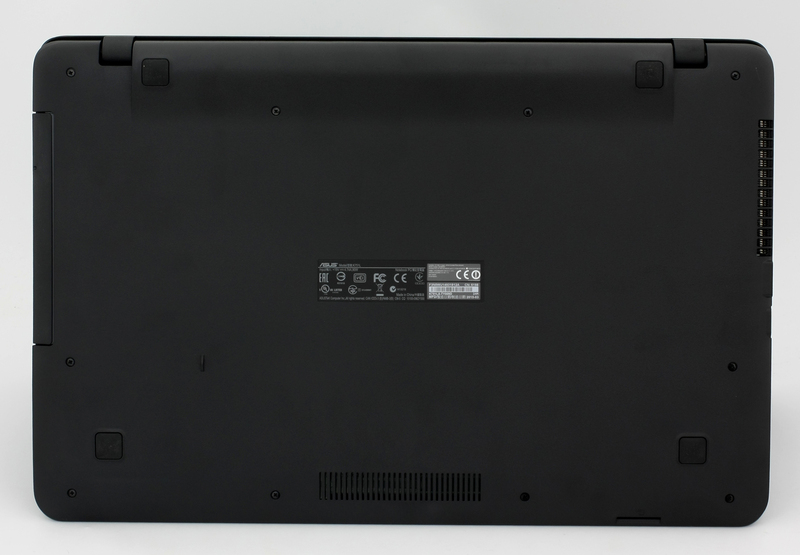 As a relatively affordable model with a 17-inch display, we cannot expect much picture quality from the K751LX. It has slightly higher resolution (1600×900) than we’re used to seeing in this class, but fails to deliver high brightness, contrast ratio, and viewing angles. On the other hand, we are pretty much okay with the sRGB color gamut coverage (79%) and native color temperature (6900K). We must note that these results are rare at this price point, so we can let it slide. Nonetheless, we are quite unhappy with the screen flickering issue. The panel emits pulsating light with a frequency of 200 Hz, making it harmful to human eyes if you don’t use it at its 100% brightness level. 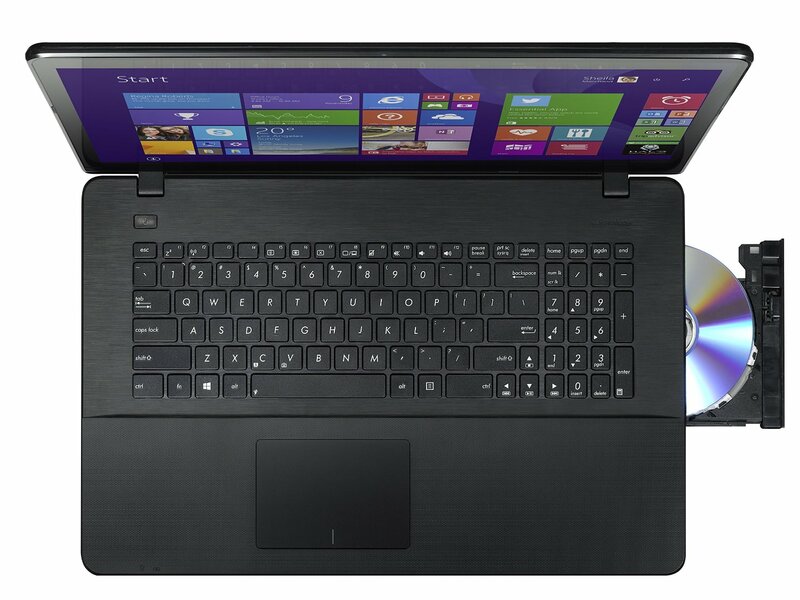 ASUS K751LX offers sound quality that’s above the average for this price range. Low tones sound very good, but the highs feel a bit distorted, yet the maximum volume is quite high. The notebook comes with a 37Wh battery that should deal with relatively energy-efficient HD+ TN panel and the ULV CPU from Intel with 15W TDP, but the GTX 950M is a bit of a bit of an energy hog. We ran the usual web browsing, video playback and gaming tests with the following settings: Wi-Fi turned on, power saver mode on and brightness set to 120 cd/m2. Pretty average result – 384 minutes (6 hours and 24 minutes). Significantly lower result – 289 minutes (4 hours and 49 minutes). The Intel Core i5-5200U processor is part of the Broadwell family and part of the “U” series CPUs. The “U” series offer a somewhat lower TDP, in this case 15W, two energy-efficient cores and higher clock rates, all in order to keep power consumption low without sacrificing performance. The Core i5-5200U is clocked at 2.2GHz base frequency and can go up to 2.7GHz for one active core and 2.7 GHz for two active cores thanks to the Turbo Boost technology. Of course, it’s based on a 64-bit architecture and it’s manufactured via a 14nm FinFET process, which means more power and less power consumption in a smaller die size to fit in smaller form factors. It also features the HyperThreading technology from Intel, which means that the CPU emulates one additional virtual core per each physical one. 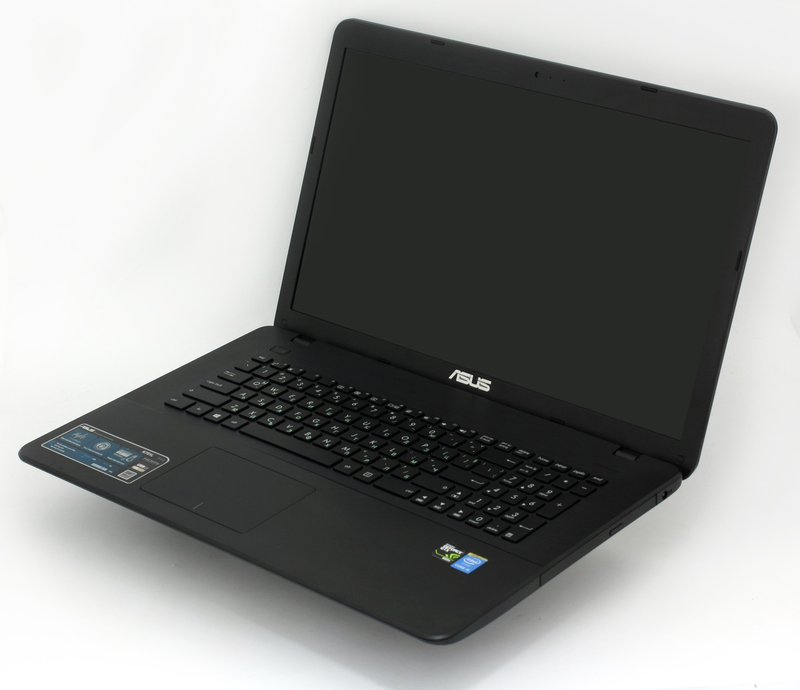 The CPU also features an Intel HD 5500 integrated GPU with a base frequency of 300MHz and 900MHz Turbo Boost. Other distinctive features are DDR3(L)-1600 Memory Controller with up to 16GB, HyperThreading, AVX, AVX2, Quick Sync, Virtualization, AES-NI, DirectX 11.2 as well as OpenCL 1.3/2.0 support and OpenGL 4.3. It’s important to add that the i5-5200U has 128KB cache at level 1, 512KB at level 2 and 3072KB at level 3. Fritz is a chess benchmark which tests the computing capabilities of the CPU with various chess moves. 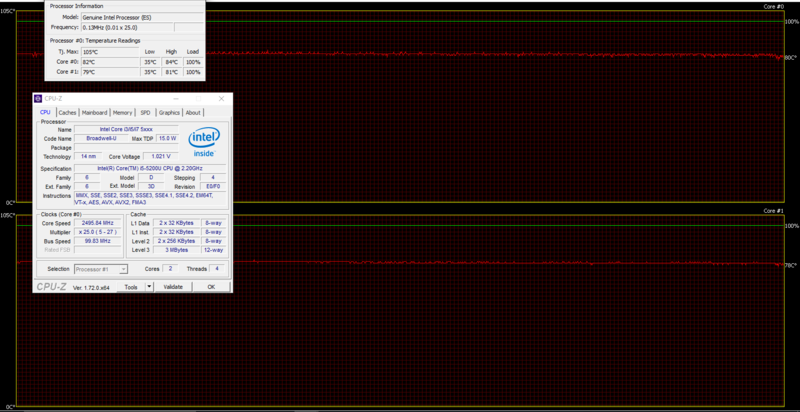 The Intel Core i5-5200U managed to get 5.035 million moves per second. In comparison, one of the most powerful PCs, Deep(er) Blue, was able to squeeze out 200 million moves per second. In 1997 Deep(er) Blue even beat the famous Garry Kasparov with 3.5 to 2.5. The GeForce GTX 950M is a direct successor to last year’s GTX 850M and it’s placed in the upper-mid range class. It is commonly used as a multimedia GPU and for some light gaming, as its properties can handle some more demanding applications. The GPU core is the GM107, similar to most Maxwell NVIDIA graphics cards, clocked at 914MHz and can go up to 1124MHz. It has 2GB DDR3 memory and the effective clock speed of the memory is 2000MHz, while there are other variants of the GPU with GDDR5 memory. However, memory width is 128 bit with 16 ROPs, 40 texture units and 640 CUDA cores (or shading units). It also features increased L2 cache size, which is now 2MB. Supports features like Battery Boost, GameStream, ShadowPlay, GPU Boost 2.0, Optimus, PhysX, CUDA, SLI and GeForce Experience. We usually run the test for around two hours. Within the first hour we only test how the cooling system handles high CPU load, after which we run the GPU stress test as well. Lastly, we measure the temperatures on the exterior to see if the cooling system does its job well. It’s a good way of assessing the overall stability of the system in the long run, but it doesn’t represent real-life usage since it’s virtually impossible to reach 100% CPU and GPU load. To be honest, testing this notebook was particularly boring, but we mean that in a good way. Nothing interesting happened and the internals were cool throughout the whole test. When idle the CPU runs at around 35 °C and gets as high as 61 °C. No throttling was observed as the CPU frequency was a solid 2.5 GHz (that’s the maximum operating frequency for two active cores). Stressing the GPU didn’t lead to any performance drops as well. The CPU temperatures rose to 84 °C, but still a good deal away from the Tj. max of 105 °C. The GPU was stable too -there were no problems whatsoever. The same goes for the external temperatures. The chassis remained cool, so it’s unlikely to cause any inconvenience even after long hours of intensive work or gaming. On the design front nothing seems to be impressive, rather, it’s simply standard. We’ve got a stern design, with good choice of patterns and finishes on the lid and interior. The three USB 3.0 ports are also a nice addition. Our final words will be regarding the screen quality and input devices. The latter is more than satisfying – we have a good keyboard with long key travel. The TN panel used for the display offers wide sRGB color gamut coverage (for its class), but has PWM across almost all brightness levels (except for the 100%), and the pulsating light is really aggressive (200 Hz). As the frequency gets lower, the negative impact increases. As we said earlier, you should use it at the 100% brightness setting.